Another Endangered Species at Trestles? Was that Bob or Blob? New!– Go to The Blob Fish Page above in the secondary banner for more blobfish (or blob fish) fun. With epic weather and waves finally picking up, do you feel like a blob today? Just guess how this guy feels. 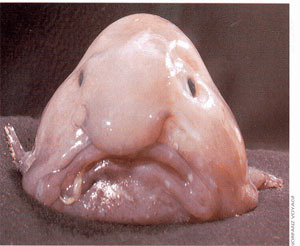 It’s a blobfish. They live in the deep water off Tasmania. I first saw this at a conference a couple weeks ago. Dr. Robert Wilkinson, a researcher with the Donald Bren School of Envorinmental Science and Management at UC Santa Barbara, was telling us how global warming is causing drastic changes in water resources and the world’s ecology. No certainty as to whether it is endangered, but it definitely got everyone’s attention. We get a lot of fish stories from the Trestles Crowd, but I haven’t heard anything about this one. Makes a great screen saver! Just don’t eat anything greasy for breakfast. And, not sure what is hanging out of his mouth.